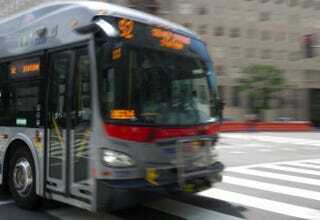 This May 20, 2014, photo shows a Metro bus on a street in Washington, D.C.
A Washington, D.C., Metrobus driver reportedly rushed to the aid of a 61-year-old visually impaired woman after seeing her being taken advantage of and robbed by a group of teen girls Monday, the transit agency said Tuesday, the Washington Post reports. According to the agency, the teens surrounded the woman and snatched her purse after she and the group got off a bus near L’Enfant Plaza. However, when the bus driver saw the older woman being harassed, he quickly came to her aid, recovering her purse for her. Two of the teens, ages 15 and 16, were arrested shortly after by transit police near the L’Enfant Plaza Metro station and charged with robbery. Another 15-year-old girl was charged with resisting arrest and fare evasion after she allegedly jumped a fare gate and ignored an officer’s warning to stop, the Post notes.